The Royal Scotsman has been running since 1985. It is a luxury tourist train that tours Scotland from May to October each year. The train's operator 'The Great Scottish & Western Railway Co.' was aquired by Orient-Express Hotels in 2005, owners of other luxury services including the Venice Simplon-Orient-Express and Northern Belle. Orient-Express Hotels itself was acquired by Belmond in early 2014. The current train was introduced in 1990. Seven of the vehicles are former ECML Pullman coaches built by Metro-Cammell in 1960. These have been extensively rebuilt for their present use. Originally this train included 99960, a 1935 LNER built teak-bodied Kitchen car, however this was damaged in shunting accident at Millerhil on 28/5/92. LNWR 5159 from the Queen of Scots train was a temporary replacement, until 317 RAVEN was introduced to the train in 1993. At the end of the 2012 season the other vintage carriage in the set was retired. 99131 Dining Car No.2, also known as VICTORY, was built by the LNER in 1945 as a Corridor First, and later converted to a inspection saloon. In the early 1980s it was numbered Sc1999, named 'Lochaber' and used as on Fort William - Mallaig trains. Its replacement as Dining Car No.2 in 2013 was 321 SWIFT (which carries the identity 321 on the data panels). Two former Mk3 Sleeping cars were added to the train in 1997, replacing two Mk1 coaches (99987 & 99966). The Mk3 coaches have been extensively modified, the air conditioning has been removed, and diesel generators are fitted to provide an electric train supply. OBSERVATION CAR	 99965	 319 SNIPE	 Lounge with open veranda at one end. The first train, in use between 1985 and 1989 was made up of Mk1 sleeping cars and 3 antique coaches: A teak bodied 1912 Great Northern Railway Saloon, a clerestory roofed 1890 LNWR dining car, and an oberservation saloon converted in 1960 from an 1892 West Coast Joint Stock carriage. These coaches then became the 'Queen of Scots' train, which also toured Scotland during the Summer of 1990. This train is now based at Carnforth, after many years at Clapham Junction. In 2005 West Coast Railway Company took over the job of providing traction from EWS. Under EWS The Royal Scotsman was usually Class 37 hauled (with some class 66s providing occasional cover), but WCRC have used Classes 31, 33, 37, 47 and 57 including locomotives hired in from other companies. Following clearance of Class 47 locomotives to Mallaig and Kyle in the Autumn of 2005, this class has featured on most tours with only the Western tour to Mallaig and Wemyss Bay seeing class 33 or class 37 traction as a second loco for 'Top and Tail' operation. 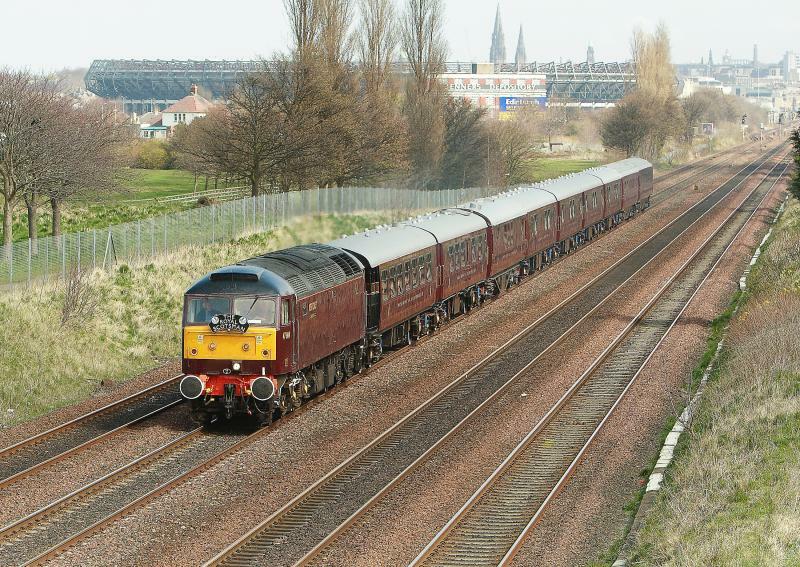 Three EWS locomotives based at Mothewell depot carried the maroon colour scheme of the Royal Scotsman train. The first, 37428, was repainted at Motherwell in April 1998 and featured large yellow numbers on the bodyside. On 14/05/98 it had GS&WR Royal Scotsman Coat of Arms on the bodyside unveiled at York Station, and also featured brass 'Three Beasts' emblem of EWS on the right-hand cabsides. Before the start of the 1999 season, 37428 was painted again, and now featured lower bodyside lining to match the coaching stock, with the large yellow number higher up the bodyside. 37428 was transferred to Cardiff in January 2001 and the Coat of Arms removed by the following month. 37428 returned to Motherwell depot and in May 2002, had GS&WR Coat of Arms refitted, plus nameplates of 'Loch Awe' on one side and 'Loch Long' on the other. In April 2003 it was given a full repaint at Toton, into unlined maroon with the loco number in small gold numerals under the driver's cabside window. 37428 was put into 'stored' status in February 2004 and Coat of Arms and nameplates were later removed. The second locomotive was 37401, repainted at Toton depot in March 2001. The livery was unlined and the loco number was in small gold numerals under the driver's cabside window, with brass 'Three Beasts' on the other cabside. The Coat of Arms were on the bodyside at the left end, and before the first tour in May 'The Royal Scotsman' nameplates were added towards the right end. The Coat of Arms had been removed by May 2005, and nameplates were removed by October 2005. 37401 was repainted back into EWS red and gold livery in March 2008. The third locomotive, 37416 , was repainted at Toton depot in April 2004. The livery was unlined and the loco number was in small gold numerals under the driver's cabside window, with a yellow decal version of EWS 'Three Beasts' on the other cabside. The Coat of Arms were carried until May 2005. 37416 was put in 'stored' status in May 2006. When West Coast Railways took over haulage in May 2005, four locomotives, (31190, 37197 'Loch Laidon', 37261 'Loch Arkaig' and 47854) were quickly painted into the maroon scheme. This was later adopted as the standard livery for WCR locomotives. In 2016, GB Railfreight took over the royal scotsman using RETB-fitted class 66. 66743 and 66746 have been repainted into Royal Scotsman livery. Classic a 720 mile, four-night trip from Edinburgh to Kyle of Lochalsh and back including visits to Strathisla Distillery, Plockton, the Strathspey Railway and Glamis Castle. Western a 660 mile, three-night trip from Edinburgh to Mallaig and back including visits to Morar Sands and the Isle of Bute. Highland a 540 mile, two-night round trip from Edinburgh via Aberdeen and Inverness including a visit to the Highland Folk museum and Strathisla Distillery. Created by scot-rail admin and last modified by craigw at 20:38, 30 of September 2018.